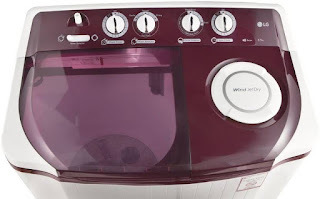 This 6.5 kg Lg washing machine has maximum spin speed of 1000 rpm. Higher Spin speed reduces drying time. 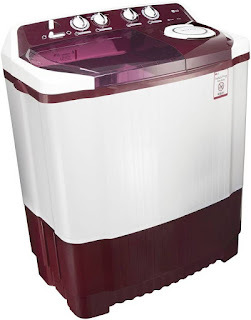 LG P7559R3FA 6.5 kg washing machine is available in burgundy and white shade. 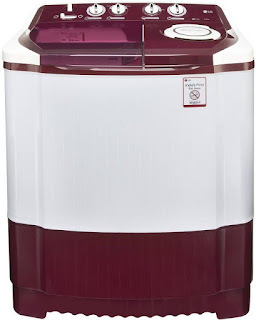 Roller Jet Pulsator provides quality wash for clothes without damaging them. Best Suitable for family of 3 members. The Machine Weighs 35 kg. Rust free plastic is used. It comes with wheel support and rat away technology. Water heater and digital display are not available on this model. Low 360 Watts power consumption. Child lock option is not provided on this machine. LG P7559R3FA also comes with Lint filter and collar Scrubber as addition features. 2 years warranty by LG. Basic Wash programs (Gentle, Normal, Strong) are provided.